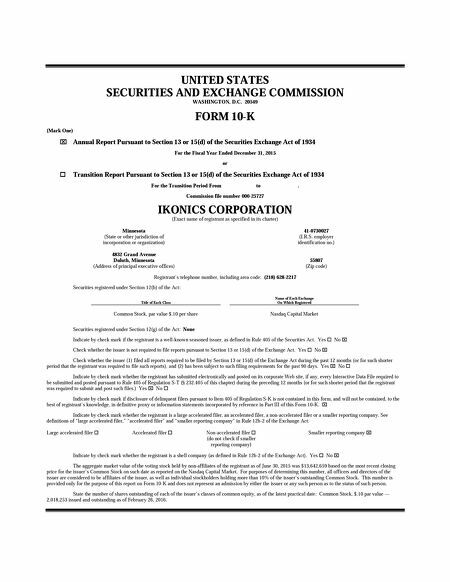 Letter to Shareholders This has been an important year for IKONICS Corporation: our Digital Texturing (DTX) business achieved profitability, and IKONICS Advanced Material Solutions (AMS) aerospace business unit experienced accelerating growth, with revenues up 92% for the year and 159% for the fourth quarter of 2015, with quarterly sales of $234,000. For the year, the Company posted net income of $135,000, or $0.07 per diluted share, compared to $0.32 per diluted share for 2014; our quarterly earnings improved each quarter of 2015. Overall sales for the year declined by 5% to $17,562,000, primarily due to a large IKONICS Imaging one-time stocking order in 2014, as well as a change of its glass supplier. The strong U.S. dollar also adversely affected export sales in 2015. However, fourth quarter sales set a record, led by AMS, as noted above, and IKONICS Imaging, which posted a 13% gain over the same quarter of 2014. Our long-term strategy of developing new businesses and new markets based on our core technologies is beginning to pay off through increased diversification and new sources of revenue. As our traditional businesses mature and sometimes meet headwinds, our new businesses, DTX and AMS, are stepping up. DTX was profitable in 2015 and AMS, although yet to be profitable, is growing rapidly. I am confident that the AMS growth trend will continue because the production schedule of the aircraft using our technology is well publicized and many of these planes are pre-sold. We know how many planes are likely to use our technology and we are adding new customers. To meet anticipated demand, a 27,000-square-foot expansion of the AMS facility is underway with completion scheduled for April of this year. I am also confident that our traditional businesses will thrive and continue to deliver profits to IKONICS. 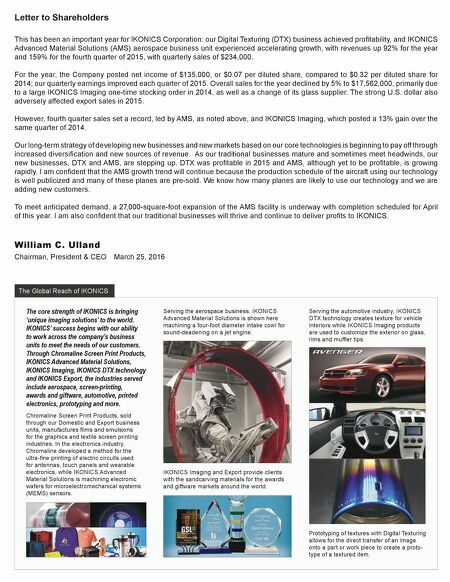 William C. Ulland Chairman, President & CEO March 25, 2016 The Global Reach of IKONICS The core strength of IKONICS is bringing 'unique imaging solutions' to the world. IKONICS' success begins with our ability to work across the company's business units to meet the needs of our customers. Through Chromaline Screen Print Products, IKONICS Advanced Material Solutions, IKONICS Imaging, IKONICS DTX technology and IKONICS Export, the industries served include aerospace, screen-printing, awards and giftware, automotive, printed electronics, prototyping and more. Chromaline Screen Print Products, sold through our Domestic and Export business units, manufactures films and emulsions for the graphics and textile screen printing industries. In the electronics industry, Chromaline developed a method for the ultra-fine printing of electric circuits used for antennas, touch panels and wearable electronics, while IKONICS Advanced Material Solutions is machining electronic wafers for microelectromechanical systems (MEMS) sensors. Serving the aerospace business, IKONICS Advanced Material Solutions is shown here machining a four-foot diameter intake cowl for sound-deadening on a jet engine. IKONICS Imaging and Export provide clients with the sandcarving materials for the awards and giftware markets around the world. Serving the automotive industry, IKONICS DTX technology creates texture for vehicle interiors while IKONICS Imaging products are used to customize the exterior on glass, rims and muffler tips. Prototyping of textures with Digital Texturing allows for the direct transfer of an image onto a part or work piece to create a proto- type of a textured item.